A lecture theatre named after renowned poet Seamus Heaney was officially unveiled in St Patrick’s Campus on Tuesday, November 27th. 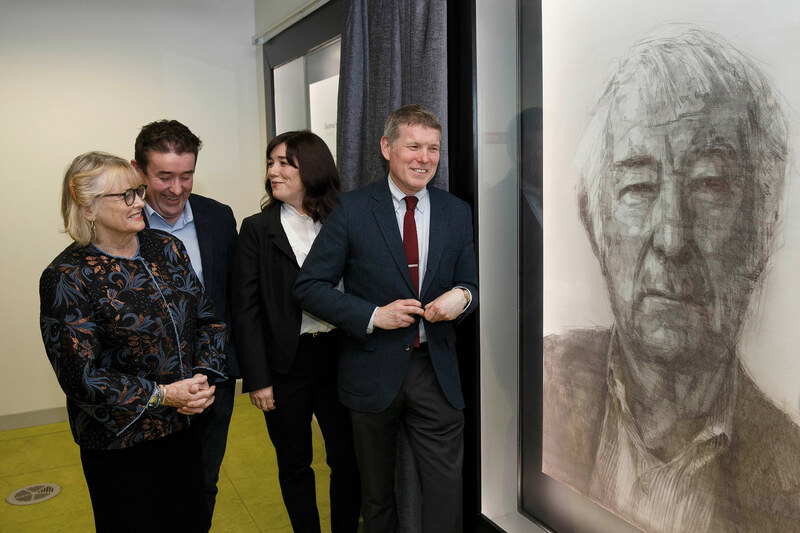 At a formal ceremony attended by Heaney’s wife Marie and children Catherine, Christopher and Michael, DCU President Professor Brian McCraith opened the Seamus Heaney Lecture Theatre in the Cregan Library. A portrait of the late poet by, drawn by Belfast artist Colin Davidson, was also unveiled at the ceremony and will hang outside the lecture theatre. Heaney’s daughter, Catherine, told the assembled audience that her family was “so grateful” that DCU had chosen to “honour” her father by naming the lecture theatre after him. “It is a fitting tribute to someone who was a committed teacher for over 40 years, and it marks his long association with St Patrick’s College and DCU,” she said. “I am very grateful to the Heaney family for allowing us name the lecture theatre in honour of Seamus,” he said. Heaney, who died in 2013, had given permission for his name to be used in a lecture series established by the college in 2000 and held every two years with a different theme.